Sagging breasts can be a thing of the past with breast lift surgery, which lifts breasts by positioning them higher on the chest. The skilled cosmetic surgeons of Cosmetic Surgery Affiliates in Oklahoma City will remove the loosened skin around the breasts, tighten the remaining skin and reposition the breasts higher on the chest wall. The results are lifted, perkier, more youthful-looking breasts. Cosmetic surgeons Dr. Erik Nuveen and Dr. Courtney Caplin performs this procedure for women whose breasts have changed due to pregnancy, breastfeeding, aging or weight loss. 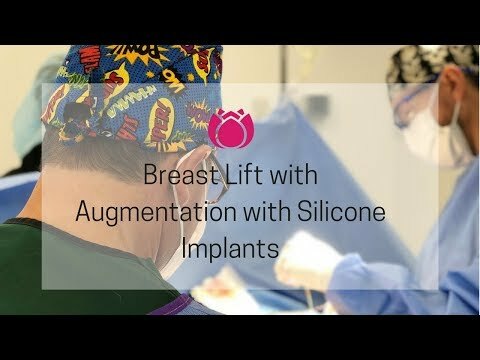 For additional volume, breast augmentation surgery can be performed with a lift. "Dr. Nuveen did a tummy tuck, breast lift, and augmentation for me. I was VERY nervous because it is a big surgery and there are always risks. He and his staff made me feel very comfortable, the surgery went very well, and I have been happy with the decision to have it done from the very beginning. I love the staff (all of them! ), they feel more like friends than anything-could not have hoped for a better experience. Jessica, who does the aesthetic injectables, is an artist! It takes a huge amount of trust to allow someone to work on the face, since it is what we present to the world everyday; I wouldn't go to anyone but Jessica for that! Her expertise and understanding of what will work best to bring our best is like no other!" "From my first over the phone consultation with Hannah, to the day of my surgery & follow ups with Dr. Nuveen and the staff, the experience with the Cosmetic Surgery Affiliates has far exceeded my expectations. I am almost one month out of surgery & my only regret is that I hadn't done it sooner. I traveled from Canada for my Breast lift & augmentation, and would recommend Dr.Nuveen and the girls to anyone I can! The facility is extremely welcoming, and I was put at ease from the moment I stepped in the door. All of my questions and concerns were answered, and the genuine concern for myself as a patient during & after my surgery is truly appreciated. After consulting with a few doctors, no one showed the compassion that Dr. Nuveen & his staff have. I can't imagine choosing anyone else! My results are absolutely amazing, I love my new look!! Thank you Dr.Nuveen & staff!" "R. Spicer - I was very nervous about my surgical experience but every staff member and Dr. Nuveen made me feel at ease. All my pre and post op questions were answered. I had a breast lift and augmentation and I feel fantastic. Since walking in the door the first time everyone called me by my name. Every staff member is very friendly, professional, courtious and knowledgeable. The staff and Dr. Nuveen himself called me several times to check on me and see how I was doing. I have recomended him to a couple of my friends already. I am in the health care field myself and am Very Impressed with my whole experience. If i decide to have any more cosmetic surgery done this is the only place i will go. Thank you so much everyone ur the greatest." "My experience - I loved Dr Nuveen and his staff! Everyone there was truly amazing and Dr Nuveen and his staff answered all my questions and I am super excited about showing off his wonderful work!! And didn't have hardly any pain after breast lift and augmentation! I already have recommended Dr Nuveen to my friends!!" "I had a breast lift in June 2013 and my augment in August 2013, and I am very pleased with the experience with both him, and his staff. Scheduling was easy and timely, surgery started on time, and the recovery has been very easy. My friends were impressed with how quickly I was up and around after my aug. After my lift, the "stick" portion of my scars looked a little pooched, but he took care of that during my aug and they look perfect to me now, and couldn't picture them better. He was easily reached on his cell phone after 8 pm when I had a concern, and wasn't off put by my call. He really treats his patients well, and I would recommend him and go back for any future procedure. I feel so much better about myself following this procedure and am glad I chose Dr. Nuveen. Thanks again!" Breast lift surgery is performed using general anesthesia at an accredited surgery facility. On average, the procedure may last up to 2 hours. The recovery will vary as some patients will have had a breast lift in combination with a reduction surgery, or with augmentation using implants. Regardless, patients will be encouraged to move around within the first 48 hours. Activities such as carrying heavy objects or any activity that puts pressure on the chest must be avoided. Most patients can resume normal activities within a couple of weeks, but exercise should not be attempted for 6-8 weeks. There will be some scarring associated with this procedure, but with extra care they will heal and fade, and many patients feel they become secondary to a more beautiful breast shape. Breast lifts cost around $5,500-$6,500 depending on how extensive the surgery is. Additional procedures, such as placing breast implants, will increase the total to about $6,200 to $8,700. Insurance does not cover breast lift surgery as it is considered cosmetic in nature. There are few exceptions depending on the patient’s special circumstances.